If your headset is not comfortable…you won’t use it! How Much Does A Good Headset Cost? You can spend $50 on a low-end corded headset from your local office supply store or pay $100-150 for a commercial grade headset, but is there really a difference? HUGE!!! You will find great differences in sound quality, headset comfort, durability, and features to name a few. Commercial-grade headsets offer multiple sized gel tips, soft foam ear cushions, and leatherette cushions, each fitting in and against your ear with a thickness you can visibly see and feel providing all-day comfort. Less expensive headsets cut costs with thin cushions, providing little to no padding and a one-size-fits-all mentality. Also with a few business grade headsets, you have the option replacing the standard cushions with circumnarual ear cushions. 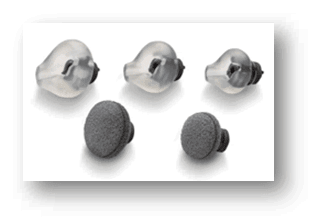 These fit around your ear and will work wonders in loud environments. If you’re having a hard time hearing your callers, upgrading your cushions will allow you to hear callers clearly and also keep you focused on your callers with less background distractions. With better headsets you will find a variety of wearing styles to find what best suits your personal preference. You can choose between over-the-ear, in-the-ear, over-the-head with one speaker, and over-the-head with two speakers. Ear models will include different sized ear tips and hooks to ensure a perfect fit. A convertible headset may also be an option, which includes multiple wearing choices, allowing you to choose what’s most comfortable. When choosing over-the-head headsets, generally speaking a single ear model will work best in environments that have little to average noise levels. This keeps one ear open so you can converse with co-works and stay aware of what’s going on around you. When you cover both ears, you will isolate yourself from what’s going on around you. Many prefer this so they can focus on their caller without distraction. Every environment is different and every users preference is different. Be sure to consider what will work best for you. If your budget doesn’t warrant spending for a commercial grade headset, you’re better off to save your money until you can afford a quality product. Furthermore, going with a $50 quick-fix option will result in frustration and wasted money as it sits in your desk drawer not being used. When choosing a business grade solution, you’re investing in a tool you will use daily to be more productive. Headset comfort, wearing style, and functionality will be the key factors as you find the perfect headset for all-day use. …find a headset with all-day wearing COMFORT!!! I would like to know more about headset. 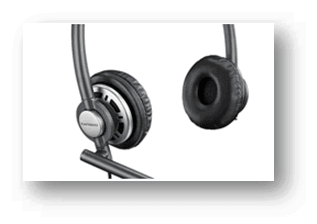 To learn more about the headset pictured, click Plantronics HW301N.